Large or small Guadalupe Bail Bonds we can help! Buy Guadalupe Bail Bonds the fast easy way! Maricopa County Bail Bonds is not just another Guadalupe bail bonds company. We pride ourselves in offering you the kind of service you would expect from a small town company. We take the time necessary toward helping you understand the Guadalupe bail bond process; we don't sell confusion, we sell satisfaction. We learned a long time ago that clients that understand the bail bond process and know their risks up front are more likely to be satisfied. Maricopa County Bail Bonds strives toward establishing strong community ties and relationships with its clients. We can provide mobile service...right to your doorstep if necessary for those individuals unable to meet us at the jail (mileage fees may apply). Maricopa County Bail Bonds has posted some of the largest bonds in the state. Large bonds, $50,000 and greater, frequently require coordinating the resources of more than one party. Client emotions are commonly strained and only bail agents who have the skills of diplomacy and are capable of smoothing a building crisis can keep these deals together. Knowledge of real estate and collateral are paramount in closing transactions quickly. Our Guadalupe agents are experts at evaluating your assets and can expedite your bail bond needs. Maricopa County Bail Bonds will exceed your expectations and meet whatever challenges your bond may bring. Learn more about Large Guadalupe Bail Bonds. Maricopa County Bail Bonds can provide mobile bail bond service throughout Guadalup allowing you to bail a loved one out of jail while still at work. Travel to Phoenix can be slow and dangerous; why risk an accident traveling to a bondsman? Maricopa County Bail Bonds offers reasonable mileage rates and the flexibility of service that the locals love. 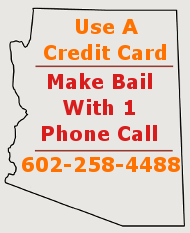 Credit card transactions are one of the quickest and easiest ways to secure a bail bond. For out-of-State / out-of-area clients, credit cards may be the only method available to post bail. The use of a credit card or cash deposit (described below) are the simplest means of posting bail. Once the case is disposed by the Court and the bond exonerated and released, the bail amount is returned to the client (premium and fees are non-refundable). Handling fees will apply. Learn more about Credit Card Guadalupe Bail Bonds. Maricopa County Bail Bonds has a strong affiliate network of bail bond companies and agents. We are prime suppliers of bail bonds in Northern Arizona providing Flagstaff bail bonds at the Coconino County Jail, Camp Verde bail bonds at the Yavapai County jail, Holbrook bail bonds at the Navajo County Jail, St Johns bail bonds at the Apache County Jail and Gila County bail bonds at the jails in Payson and Globe.